In my opinion it is unimportant whether the walk over living coals can be explained with physical terms or not. It is a primordial and very powerful experience which initiates the walker and can induce strong and lasting changings in his personality structures. 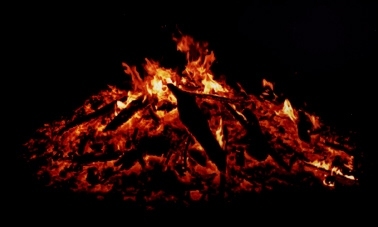 The fire is a cleansing and resolving friend to the walker. You can estimate the meaning of the word "clearance" when standing in front of a bed of living coals, seven to ten meters long. Without this clearance of your existence every single step over the living coals will be harmful to you. This clearance is the absence of doubt. You cannot "walk only a little bit over coals": You either are walking or not, simply that. Of course the preparations before the actual firewalking is of some importance, too. Exaggerated rituals as well as an easy-going mentality are both not appropriate. 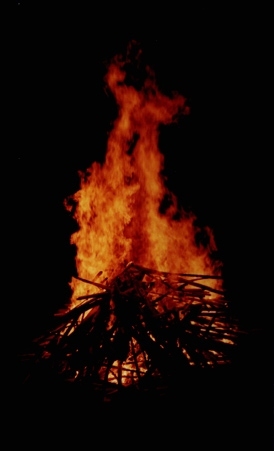 A firewalking event does not deserve being suffocated by over-emphasized spirituality and dogmas as well as it of course does not deserve being treated without respect, either. Every firewalking event is unique in its nature. The motive of the walker is of great importance, too. The first method can be a test whether the belief in the numinous is powerful and strong enough. The second way is a test on the willpower, the third tests the abilities of imagination and magical discipline, the fourth the "Neither-Neither" state of mind. You can get burnings during a firewalk, in spite of contrary statements by physicists. Do not forget this (I am sure, this won't happen). The cleansing power of the fire spirits can do minimal burnings at certain reflex zones at the feet, activating these points on this way. The walker trusts his spirits or his deity. The confidence in the spirits guide the steps of the walker. Scientists often have the science as a powerful spirit. The walker concentrates the full emotional potential of the will to reach the other end without problems. The unidirectional nature of this focussing guide the steps over the red glowing coals. He is gazing at a point on the other side in order to reach it and focus his mind on this point as goal. The Walker imagines himself walking over green moss or something other during actual walking over the red hot coals. The Walker is absolutely present during his steps over the glowing heat. He is conscious about his feet touching the glowing coals and is actual in the state of mind, Spare described as "Neither-Neither", a state of consciousness which is very powerful and enlightening.